Latest price of Samsung Galaxy A8s in India was fetched online from Flipkart, Amazon, Snapdeal, Shopclues and Tata Cliq. 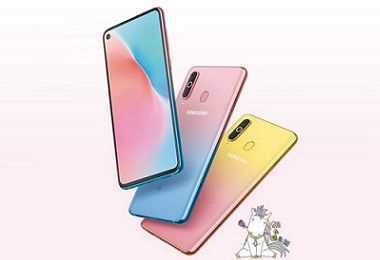 "Samsung Galaxy A8s Gets Two New Pink Gradient Colour Variants in China"
"Samsung Galaxy A8s Goes on Pre-Order in China: Price Starts at 2,999 Yuan"
"Samsung Galaxy A8s Will Be World’s First Smartphone with Display Hole: Launch set for December 10"
Displays with a notch became a norm in 2018. If the recent releases of 2019 are any signs of the future, this new year is expected to be full of phones with punch-hole camera cutouts. 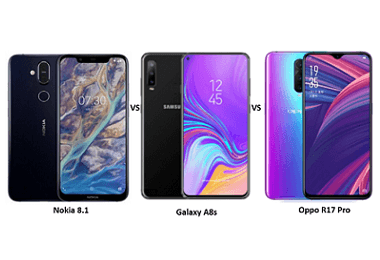 While most of such smartphones are generally at the higher end of the price scale, Samsung has recently launched Galaxy A8s, a midrange smartphone with a punch-hole cutout for the front camera. 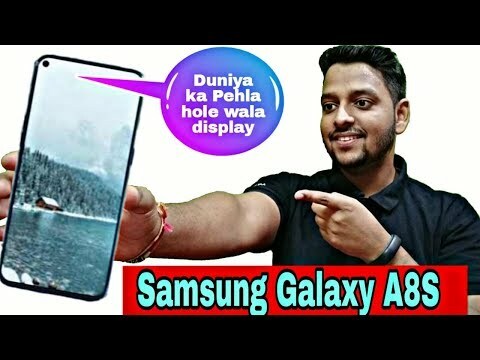 And being one of the early adopters of this new trend is not the only thing exciting about Samsung Galaxy A8s. 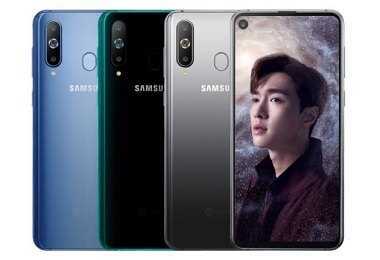 Samsung Galaxy A8S features three cameras at the back, the first of which is a 24MP camera with an aperture of f/1.7, second 10MP camera with an aperture of f/2.4, and the third 5MP rear camera with an f/2.2 aperture. On the front, the phone features a 24MP camera with an aperture of f/2.0 to help users take great selfies. 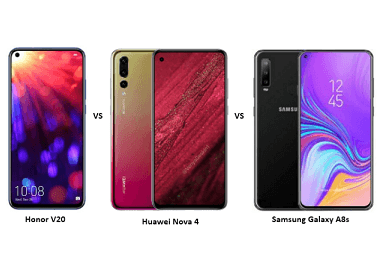 Samsung Galaxy M30, Galaxy A50, and Galaxy A7 are some of the other popular phones from the South Korean smartphone manufacturer that feature a triple rear camera set up. Talking about the storage, A8s has a built-in storage of 128GB, and you can also use a microSD card of up to 256GB to increase the storage space further. Galaxy A8s runs on a 3,400mAh Li-ion non-removable battery. Most of the users agree that the phone can easily last an entire day on full charge. It also supports fast battery charging to help users quickly recharge their phones. It has a 6.4-inches Infinity-O display with a cutout for the front camera. 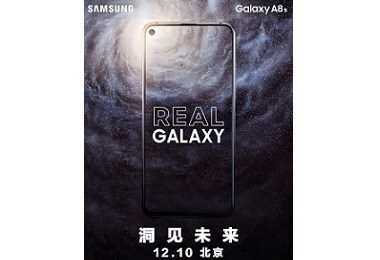 The display has a resolution of 2340 x 1080p and a pixel density of 403ppi which is in line with other phones in the Samsung Galaxy A8s price range. The phone is not just protected with Corning Gorilla Glass 3 on the front but also has Corning Gorilla Glass 5 on the back for enhanced safety. Samsung Galaxy A8s is a dual SIM phone which supports dual Nano SIM cards and 4G on both the cards. It also supports Wi-Fi 802.11, Wi-Fi Direct, Dual-Band Wi-Fi, and hotspot. Some other connectivity options on the phone are Bluetooth 5.0, GPS with GLONASS and A-GPS, FM radio, NFC, and USB Type C 2.0 which is now found on most latest devices. It also features a fingerprint sensor at the back and other sensors and features like accelerometer, proximity sensor, compass, and gyro. Moreover, it also supports ANT+, a new technology which allows the phone to monitor data from many different types of sensors such as heart-rate sensors. The phone is powered by Android 9 Pie to ensure that the users get to experience the latest version of Android OS with all of its improvements and upgrades.